AgriMaster Model RS Pro Series Heavy Duty Wagons built with frames that are engineered to be flexible & strong. 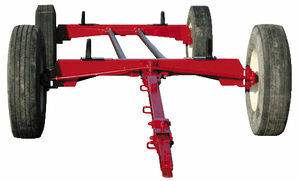 All wagons have our quick hitch tongue as standard equipment. Tongue Spring Balancer Kit SPBK available for all models. All wagons can be ordered without tires (rims only), or different tire/rim sizes and ply ratings, enquire. Double reach on all models. NOTE: Wagon capacity is indicative only and is the Hub and Axle maximum rating. Actual maximum capacity is to be determined by the choice of rims and tire load limit (tire pressure, speed, etc). Standard Equipment: quick hitch compatible, tapered stainless steel, steering bearings, hardened bronze bushings, taper roller bearings, 15' wheel base. RS50 5 TON FARM WAGON 655 lbs 10,000 lbs 78" 7/8" 1-3/4" 4" * 3"
RS80 8 TON FARM WAGON 795 lbs 16,000 lbs 78" 1" 1-3/4" 5" * 3"
RS105 10 TON FARM WAGON 835 lbs 20,000 lbs 78" 1" 2" 6" * 3"
RS120 12 TON FARM WAGON 1,350 lbs 24,000 lbs 78" 1" 2-1/4" 6" * 3"
RS130 13 TON FARM WAGON 1,375 lbs 26,000 lbs 86" 1-1/8" 2-1/2" 8" * 4"
RS150 15 TON FARM WAGON 2,810 lbs 30,000 lbs 86" 1-1/4" 2-3/4" 8" * 4"